For anybody who works on the move quite a lot, this latest concept design for a laptop bag that converts into both a chair and a portable desk will no doubt seem highly appealing. 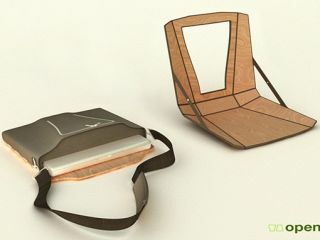 The Openaire is Nick and Beau Trincia's concept design for the future of laptop luggage. And if you have ever been delayed in a busy airport lounge, then you will immediately realise the inspiration behind the design. The semi-rigid case is constructed from wood and fabric, with an outer skin that pulls out to flip into a small chair – it's a rudimentary chair, to be fair, but it would beat sitting on a cold and dirty floor in a departure lounge any day of the week. The case itself then folds out into a lap-desk with two flip panels, ideal for using a wireless mouse on the one side, while carefully balancing a cup of coffee on the other. It is a fantastic concept and we can only hope that the designers manage to reach the point of commercially producing, marketing and distributing their idea at some point soon. The design is modular, which also means that you can leave the seat at home for day-to-day use.